Okay, can you blame me for wanting to do some holiday things? Yeah. I know. Lack of updates. Oops! Not to say that I haven’t been working. I’ve been to shops for supplies, I’ve done.. stuff? 😛 Anywho, I’m here with a tutorial! 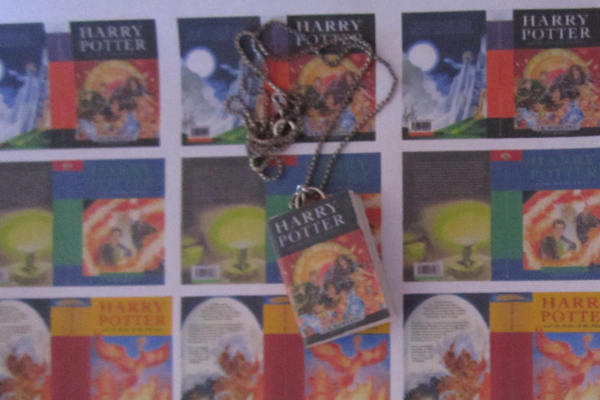 For the release of Deathly Hallows Part 2, I made 4 necklaces for me and my friends to wear of the Deathly Hallows book (pictured below). They were so cute and easy to make, and recieved a number of comments. The girls loved them 🙂 I think I timed it at about 30 mins per necklace, made out of pretty much just cardboard (I used the thin cardboard of old Christmas cards for the inside pages, with a slightly thicker cardboard for the covers). Stick a paperclip slapped in the middle and you’ve got yourself a hook. 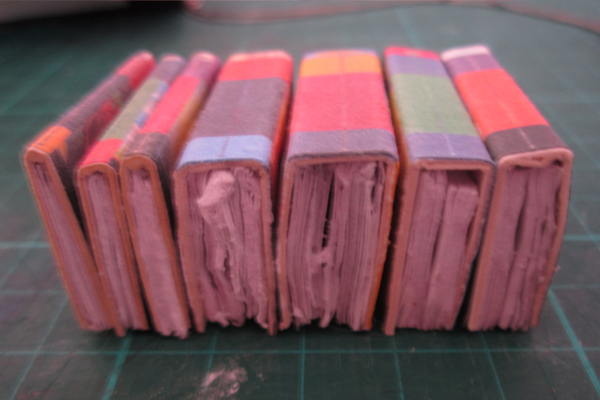 Anyway, I finally got around to doing the whole set of books, though instead of having cardboard pages, I used paper. Please note though, that these books do not open up. Start off by printing off the covers you want (to scale). To start you off, you can download the document I used with the British covers (please excuse the file size!). I had trouble finding some of the back covers and spines online, so you may have to do a bit of hunting. 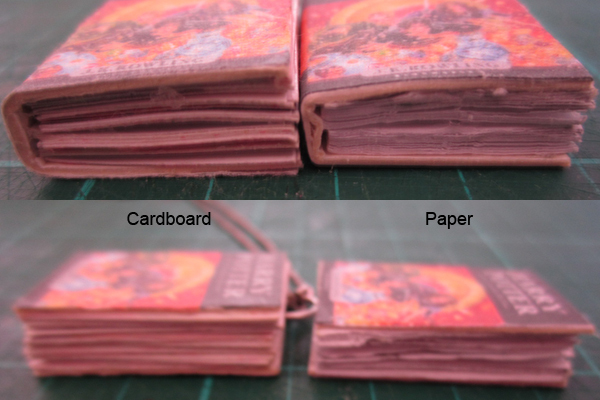 My covers were each around 3cm in height, and between 4.6-5.3cm in width (including the back cover and spine), but you can have a fiddle and make them slightly smaller or larger. Once that is done, you’ll want to cut out and glue each of the covers to a piece of sturdy, thin cardboard approximately 1mm in thickness. You don’t want it too thin or too thick, just thick enough to be able to handle a bit of wear and tear. 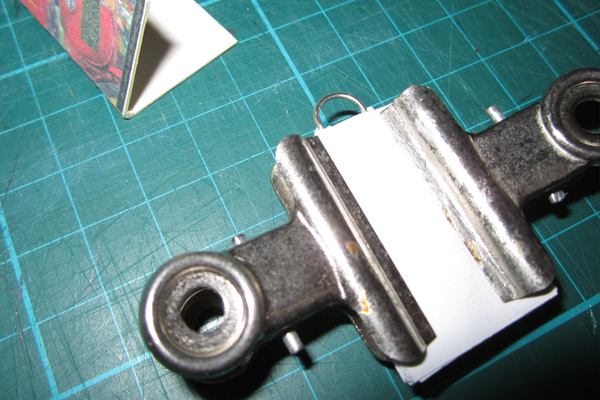 When dry, fold both edges of the spine over a sharp, flat edge. I used a metal ruler, though the edge of a desk or bench would do. 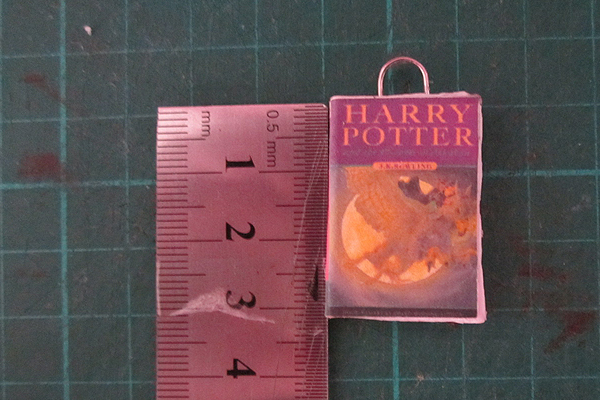 You then have the tedious task (and what takes the longest) of measuring up the pages and cutting them out. The pages should be slightly thinner than the measurement of your front cover. I think I ended up fitting 80 or 90 of these pages to 1 sheet of A4 paper, so while it doesn’t take up too much paper, it does take time and effort to slice them all up neatly on a cutting board. I had a stencil for each page size, but this actually made the pages slightly too big (because when you draw around the stencil, it brings the edge out more) and I had to cut them down which made them messy and ick (pictures below). So, be careful to know your page measurements exactly. Listed below is how many pages I used for each book, though this will change if your sizes are different to mine. 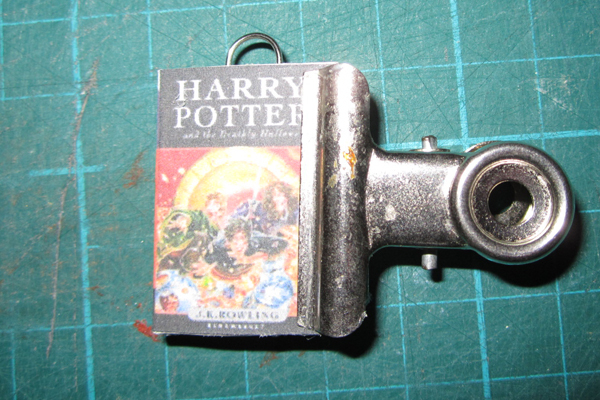 Just keep measuring the pages inside the book cover with a paperclip in the middle. Warning: Measure the pages carefully! You don’t want to have to cut them down later after you find out they don’t stick inside the cover. After they’re glued, the pages stick together, go soft and cutting results in soft, roughed edges as opposed to clean cut pages. 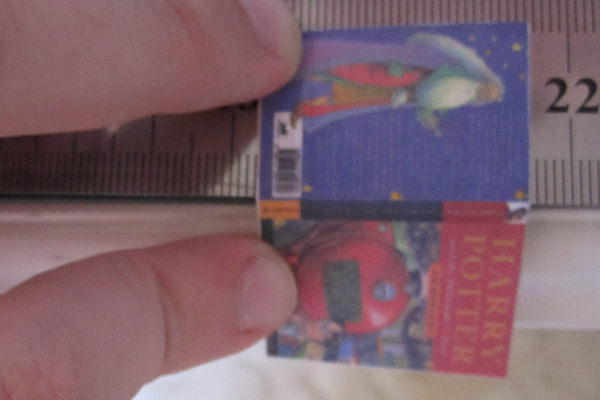 As you can see here, HBP is probably the book with the neatest edges, but I cut half of them too short. It pays to take your time with these. 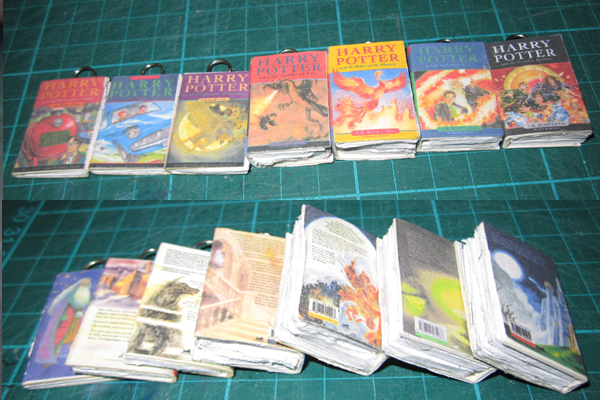 Once you have sorted out how many pages you want, you’ll want to half them into 2 piles. And then… glue them. Paranoia getting the better of me, I glued together every single page. Suprisingly, it didn’t take too long, as it was just one quick dab on top of the glue stick slapped onto the next page and the next page… make sure you line them up nice and evenly though or this can cause problems. When you’ve glued the two separate piles, you’ll want to glue on the paperclip. 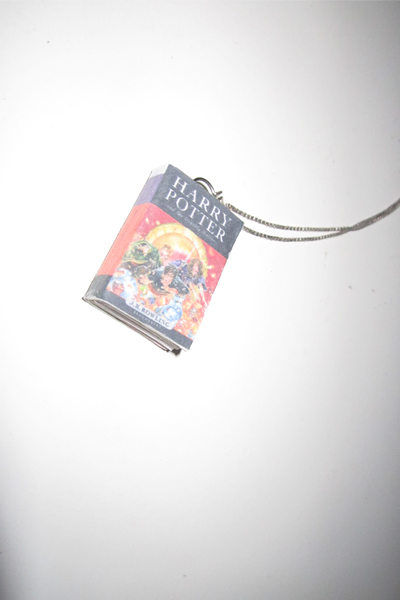 Of course, your necklace charm will need a hook to actually loop onto the necklace, and the paperclip idea came to me so simply. You can buy boxes of paperclips (ours is 600) and whoever goes through them all?? This puts them to good use 😉 You can use the glue stick if you’d like, but you’ll have to make it really thick to be able to get the clip to stay on. I originally did this, then I switched to craft glue. 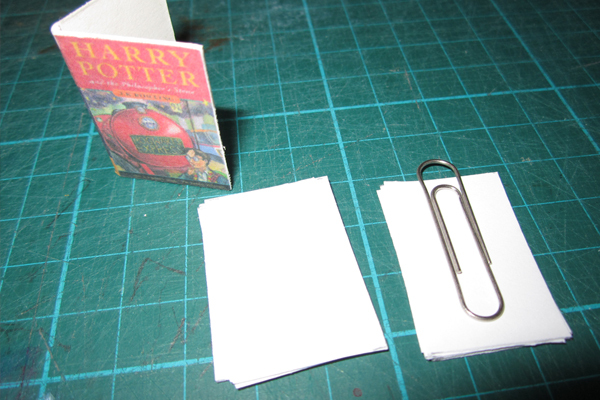 While it’s still wet, glue the second pile of pages on top so the paperclip is sitting in the middle. Hold dry. Bulldog clips come in handy. 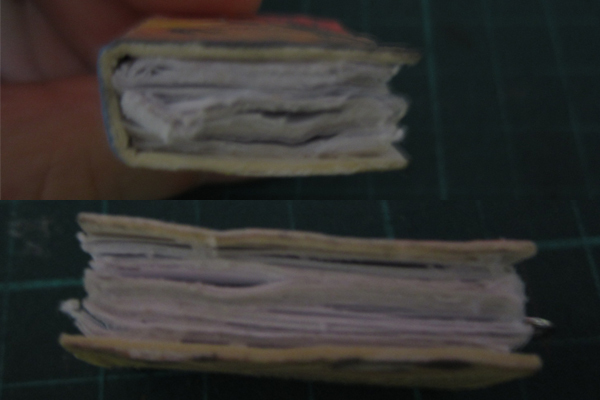 When that is dry, you’ll then want to smear the inside of the front cover with craft glue and place the pages in between. Again, hold dry. And where have I decided to keep all these? 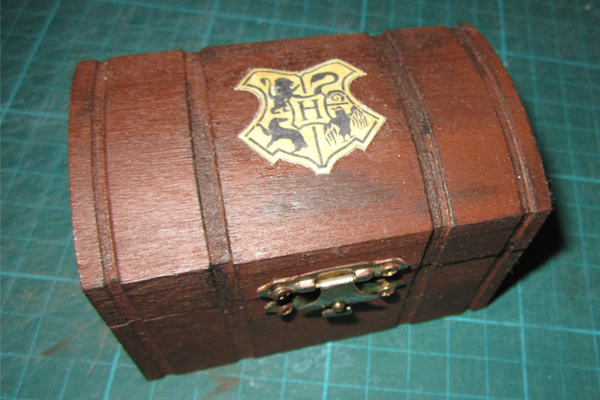 I found an old jewellery box I had. 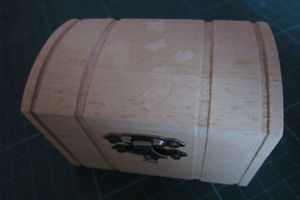 A raw, wooden treasure chest you can find at craft stores. 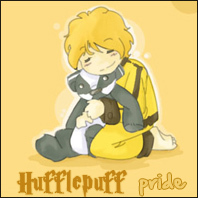 I had always hated it, and I’d only packed it away a few months ago into a box. It had butterfly stickers or something on it I finally peeled off which left a mark. It was just… plain. Amazing what a coat of paint can do, aye? 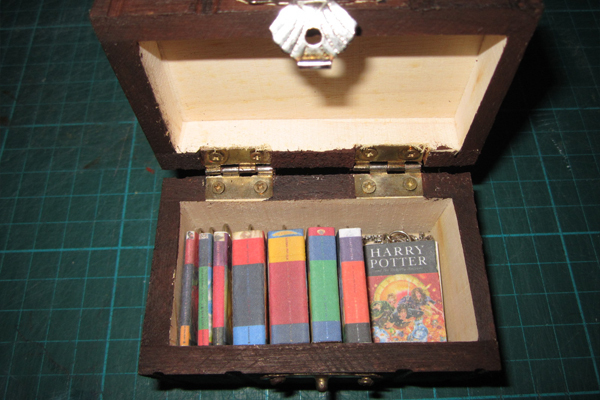 Hello little Hogwarts trunk! The logo is simply glued on and is courtesy of The RPF Forum. ~ by acciomagic on December 2, 2011.